Rebecca Lush was a student volunteer with the Geoffrey Kaye Museum in 2015. She is currently Curator, Harry Daly Museum. As an undergraduate, Rebecca investigated the Salem Witchcraft Trials, including the possible role of ergot. She has prepared this post based on her previous research. 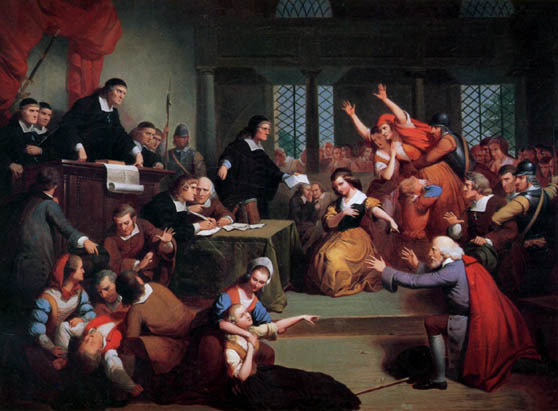 The Salem Witchcraft Trials occurred from approximately January, 1692 until May, 1693. The first witchcraft accusation was sparked by a medical diagnosis made by Dr William Griggs in 1692. Three years earlier Reverend Samuel Parris, his wife Elizabeth, daughter Betty, niece Abigail Williams and two slaves, John Indian and Tituba, had moved to Salem Village, the area now modern-day Danvers, from Barbados. Parris became the pastor of Salem Village and was aided by his wife in ministering to the religious and spiritual well-being of the community. This meant their children were left in the care of their house servant, Tituba. There is much contestation about whether Tituba taught the girls voodoo or some mythical dark magic. What is clear, however, is that when Betty Parris, Abigail Williams and their friend, Ann Putnam Junior, began to experience inexplicable fits and hallucinations, the cause was attributed to witchcraft. Puritan Minister, John Hale of Beverley, and Reverend Nicholas Noyes of Salem Town questioned the afflicted girls. During their questioning, the girls accused residents Sarah Good and Sarah Osborne, and their servant, Tituba, of witchcraft. As Salem Town and Village had no official court, John Hathorne and Jonathan Corwin, two Salem magistrates, arrested the accused and interrogated them on March 1, 1692 in the Salem Village Meeting House. The trials were a two-part legal process beginning with a preliminary examination followed by the trial itself. Suspects were usually imprisoned while awaiting trial. 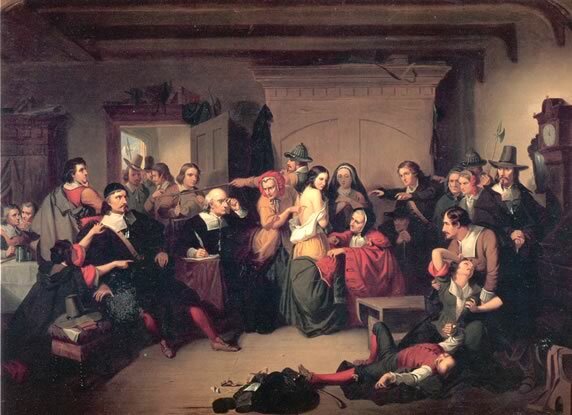 By May, 1692 the formal court, Oyer and Terminer, was established with Hathorne and Corwin joining other judges, for example Samuel Sewall, to prosecute the more than two hundred women and men accused of witchcraft. Allowing for the submission of spectral evidence, that derived from dreams or visions, would later lead to the closure of the courts at the beginning of 1693. I saw a thing like a man, that told me serve him and I told him no I would not do such thing. She Charges Goody Osborne and Sarah Good as those that hurt the Children and would have had her done it. Some argue that were it not for Tituba’s testimony, the hysteria would not have continued. Her testimony confirmed the community’s fear of witchcraft and encouraged the authorities to embark on a witch-hunt. Sarah Osborne was the first casualty of the trials, dying in jail on May 10, 1692. The reasons behind the accusations varied. They included desperation on the part of those accused, as accusing others led to increased numbers waiting for trial, hence, delaying your own trial. Motivations also included jealousy, fear and even revenge. In a community where access to land and resources was limited, jealousy was a major motivating factor. For example, one of the victims, Bridget Bishop, was resented due to her extensive land holdings and material wealth. Overall there were nineteen formal hangings and one death by crushing. Bridget Bishop was the first to be hanged on June 10, 1692 followed by five others on July 19: Sarah Good, Elizabeth Howe, Susannah Martin, Rebecca Nurse and Sarah Wilds. On August 19, an additional five people were hanged: George Burroughs, Martha Carrier, George Jacobs Senior, John Proctor and John Willard. A month later, on September 19, Giles Corey was crushed to death. The last formal executions for witchcraft took place on September 22, 1692 with the hanging of Martha Corey, Mary Easty, Alice Parker, Mary Parker, Ann Pudeator, Wilmott Reed, Margaret Scott and Samuel Wardell. The Oyer and Terminer courts were closed on October 29, 1692 in Salem Town. 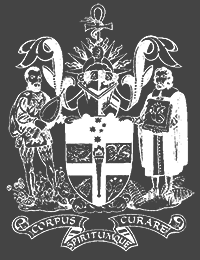 Almost one month later on 25 November 1692 the Superior Court was quickly established to address the remaining matters of witchcraft. The concluding point of the trials can be regarded as May, 1693 as there were no individuals arrested on charges of witchcraft after this date and those remaining in prison were pardoned. Although brief, the Salem Witchcraft Trials have captured the attention and imagination of America. The cause of the afflicted girls’ troubles has continued to be at the centre of many debates. In 1976 Linnda Caporael suggested that the girls were victims of ergot poisoning. For many, this claim was and continues to be valid. Ergot grows on rye bread in moist, cold conditions. As Salem was situated on swampy meadows, a perfect breeding ground was created. When consumed ergot can cause a variety of symptoms. Children and teenagers are most susceptible to its effects which explains why the girls of Salem were affected to such a great extent. Symptoms can range from giddiness and fatigue to muscle spasms and, more severely, fits. Turning to the court transcripts from the trials and diaries kept by residents of Salem, this suggestion of ergot poisoning is further legitimised. In the early trials the girls would frequently fall into fits in the court room all of which were recorded in the transcripts. When called to testify, the girls would describe their symptoms in some depth stating they had severe muscle aches, nausea, and hallucinations. Despite these links, there is still controversy over ergot’s role in the trials. 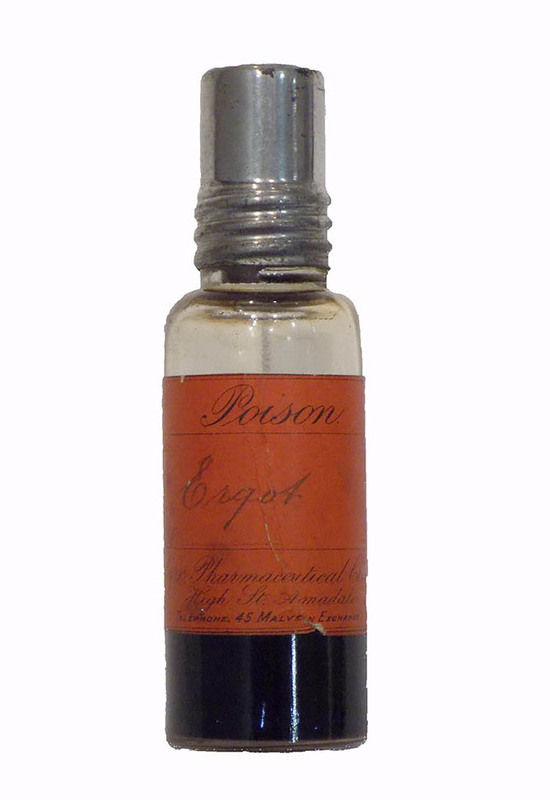 Could misdiagnosed poisoning really have caused mass hysteria and the imprisonment and even deaths of its victims? Why was no one else afflicted? Questions such as these will no doubt continue to persist as the trials are constantly rewritten in order to make sense of the senseless. Why is ergot in the collection of an anaesthetic museum? From the 17th Century ergot was used to control postpartum haemorrhage and cause contraction of the uterus. It is still used in obstetrics and anaesthetists give it intravenously following the delivery of a baby in Caesareans where there is prolonged bleeding. Brown, D. C., A Guide to the Salem Witchcraft Hysteria of 1692, 6th ed. America: David Brown Book Company, 2006. Hill, F., The Salem Witch Trials Reader. Cambridge, Massachusetts: Da Capo Press, 2000. Breslaw, E., G., Tituba, Reluctant Witch of Salem: Devilish Indians and Puritan Fantasies. New York: New York University Press, 1996. Mappen, M., Witches & Historians: Interpretations of Salem, 2nd ed. Florida: Krieger Publishing Company, 1996. Roach, M. K., The Salem Witch Trials: A Day-by-Day Chronicle of a Community Under Siege. Maryland: Taylor Trade Publishing, 2004. Corwin, J., “Tittube, the Indn Woemn examn. March.1.169½,” Trial Transcript, Salem, Massachusetts. New York: New York Public Library, 1692. Norton, M. B., In the devil’s snare: the Salem witchcraft crisis of 1692. New York: Vintage Books, 2003. Hill, F., A Delusion of Satan: The Full History of the Salem Witch Trials. Connecticut: Tantor Media, 2002. Roach, M., K., Deaths Caused by the Salem Witch Trials, Poster. Salem, Massachusetts: Salem Witch Museum. Matossian, M., “Ergot and the Salem Witchcraft Affair”, American Scientist, 70, no. 4 (1982): 355-357. Spanos, N., “Ergotism and the Salem Witch Panic: A Critical Analysis and an Alternative Conceptualization”, Journal of the History of the Behavioural Sciences 19, (1983): 358-370. Woolf, A., “Witchcraft or Mycotoxin? The Salem Witch Trials”, Journal of Toxicology: Clinical Toxicology, 38, no. 4 (2000): 457-460.